… 20th May 2012. 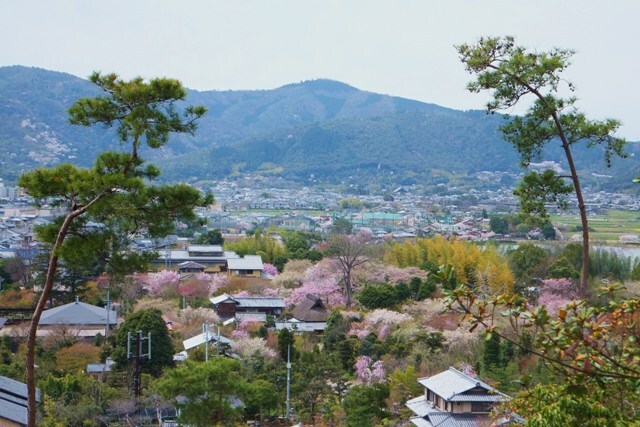 A bus from JR Wakayama Station takes 12 Hailstone poets to 不老橋 Furō Bridge opposite 塩竈神社 Shiogama Shrine, whose ancient sanctum is carved out of the striated cliffs and topped with a gnarled pine tree that seems an extension of the rock itself. There, we watch the priest bless first an infant; then, a dog. all wish happiness for the newborn. … We visit 玉津島神社 Tamatsushima Shrine, one of the three patron shrines of 和歌 waka and repository of a designated natural monument – an ancient tree (another pine?) writhing in fantastic tortured shapes. Here, we observe a wedding; the bride in traditional white bonnet, white gown. One hundred steps above the shrine, the view from 奠供山 Mt. 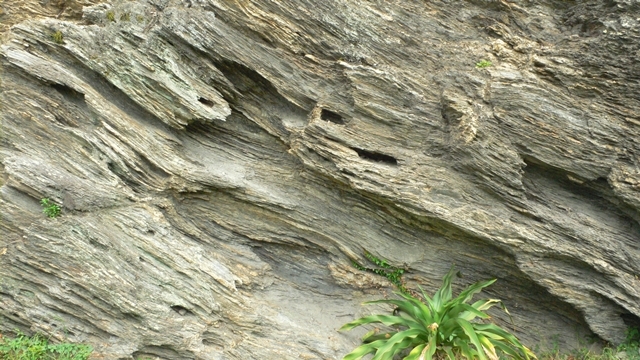 Tengu, which Emperor Shōmu climbed with the poet, 山辺赤人 Yamabe no Akahito, early in the eighth century, unscrolls Wakanoura Bay before us. … A convivial lunch is washed down with drinks of fresh ginger; and we are soon walking again, along あしべ通り Ashibe St. beside a tidal canal (punctuated by derelict wooden fishing boats) towards Wakanoura port, where we turn off through 御手洗池公園 Mitarai-ike Park. 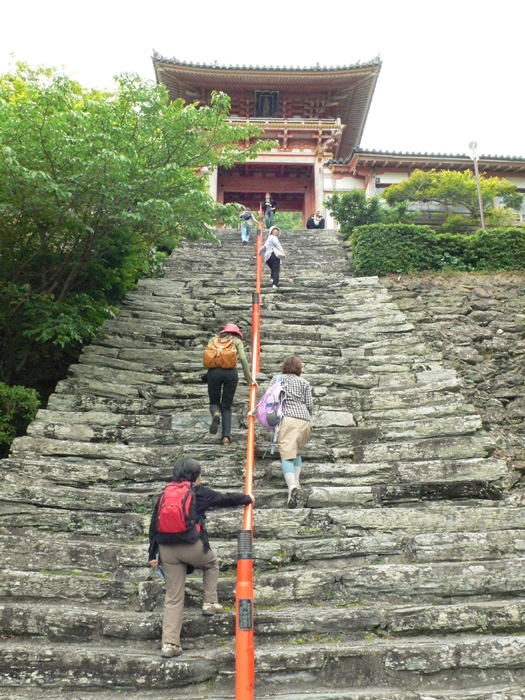 Beyond are the steep, nobly weathered green stone steps leading up to 和歌浦天満宮 Wakaura-Tenmangū, one of the nation’s three chief Tenmangū shrines, each dedicated to 菅原道真 Sugawara no Michizane, a Heian scholar and diplomat later deified as 天神 Tenjin, God of Learning. 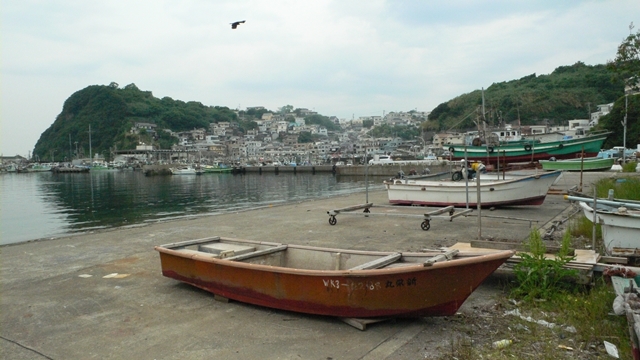 Wakanoura is the port from where he left on exile. … We head west, following the coastline, past near-deserted docks, around a pristine cove of clear water, through a booming tunnel, past a beach crowded with locals enjoying their Sunday barbecues … all the time, haunted by the district’s strange green stone. … All too soon it is time for the daytrippers amongst us to catch their return bus. Those who remain press on for 番所庭園 Bandoko Gardens, a ‘nose’ (番所の鼻) of lush green sticking out into the Pacific Ocean. ………………………………………………….. My friend’s deep sigh. Flanked by four islets, the tiny peninsula is an oasis of calm, a world apart from the busy industrial portland coming into view away to the north. 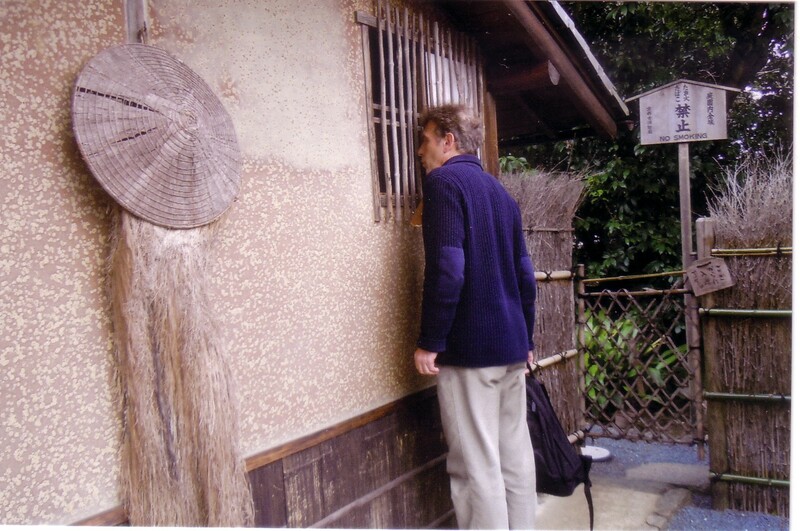 … Checking in at Manpa Hotel, the first rain begins to fall. 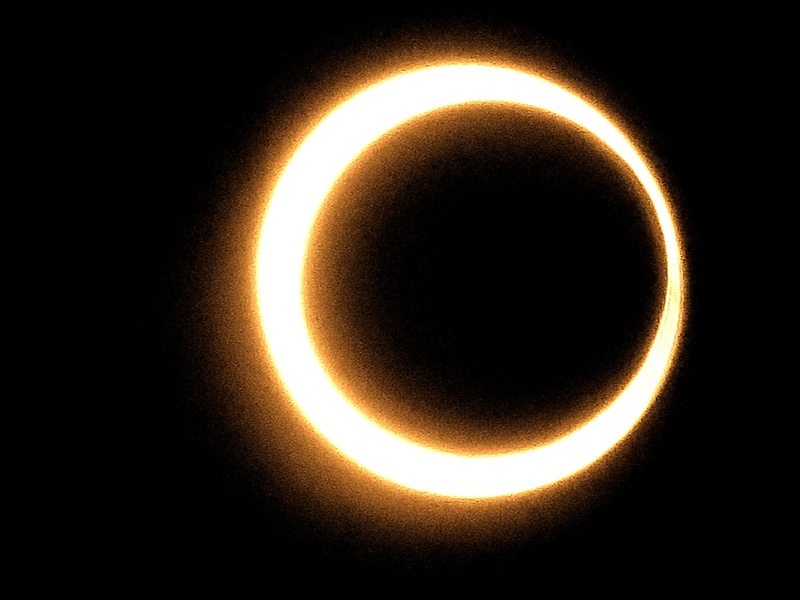 What weather will the day of the eclipse bring us, we wonder. Haiku written during the day are later shared, grinned and beared. … The 21st dawns fine, with but a few small veils of light cloud, soon melting off. We move to our various stations, sun-viewing sheets in hand. 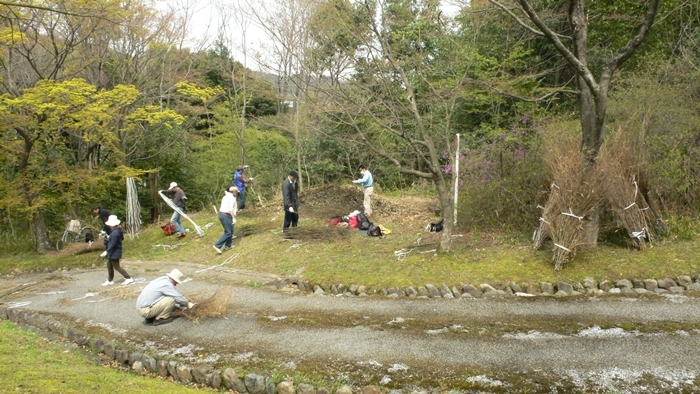 Two of the remaining party climb a nearby hill; others mount a giant rock at the seashore. By 7:30 am, the moon is upon us, the light on the sea now an amber early evening cast. April 5th. 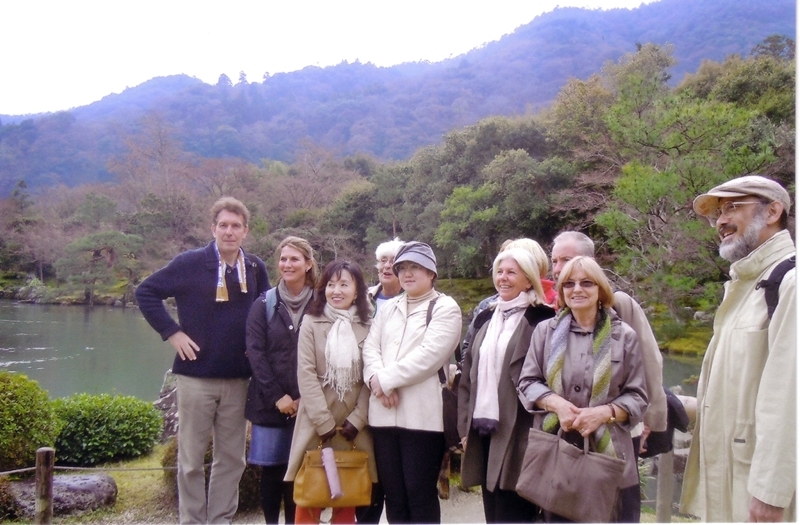 Five Hailstones joined a group of Australian and New Zealand haiku and tanka poets (coordinated by Eucalypt‘s Beverley George) for a temple lunch and a stroll around Muso Soseki’s 14th Century Sogenchi 曹源池 Water Garden at Tenryuji Zen Temple in Sagano. 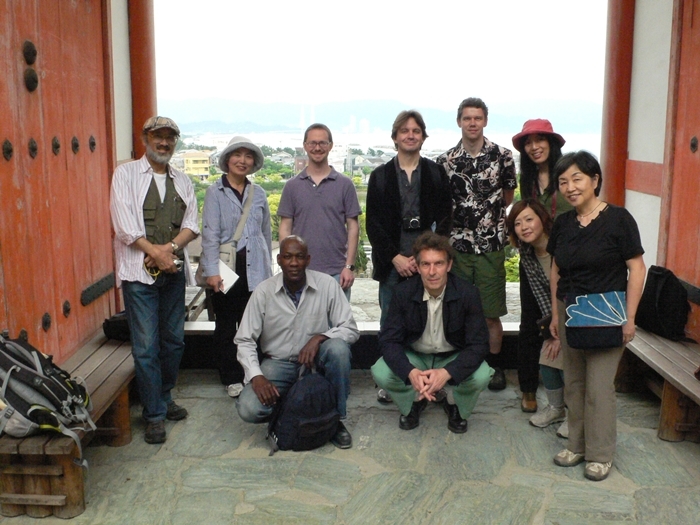 Earlier, Tito had given the visitors a lecture on the literary history of the area at Kyorai’s house, Rakushisha 落柿舎. …. of the weaver’s loom . . .
Jackdaws by D J Peel (Takenoko), U.K.
Crime and Punishment by Cara Holman, U.S.A.
Kite in August by Carol Pearce, U.S.A.
Gandolph and Merlin by Pearl Elizabeth Dell May, U.K.
Timeline by Roberta Beary, U.S.A.
.. We received a total of 96 entries from 14 different countries. We are very pleased with this result and should like to thank all the contributors for their warm support. The general level of the works was high enough, but it was difficult for the judges to single out a piece for the Grand Prix. Also, it was equally difficult for the judges to limit the number of Honourable Mentions to five since so many works followed close on their heels. Our hearty congratulations go to the authors of the decorated works. .. Some works ran over onto a second page, and others were too short. We also received a copy of previously published work, and one entrant wrote his name at the top of the page! All such minor violations of the rules present us with problems. We have slightly revised the guidelines for next year’s Contest, outlined via the page link at top right of this screen. The main change is that in 2113, instead of a length stipulation of anything up to 30 lines, we have made it 20-40 lines. We hope thereby to encourage rather longer haibun. The top four haibun from 2012 will be reproduced on this site shortly, under a special page link, for anyone to read.